David Miranda joins the Bristol Hospitality Group as Corporate Finance Director in 2014. Under his responsibilities are to safeguard the financial interests of the Bristol Panama Hotel, Wyndham Panama Albrook Mall, The Buenaventura Golf and Beach Resort, Villa Marina Lodge, Buenaventura Golf Club and Buenaventura Food Services. 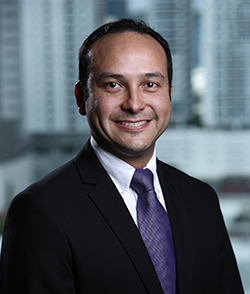 Mr. Miranda has extensive financial experience in the hotel sector, serving for more than 10 years as Financial Comptroller of prestigious Marriott hotels in Miami, Florida. As well as Financial Comptroller of Gansevoort Miami Beach Hotel, Spa & Residences, today known as The 1 Hotel South Beach. David graduated from Finance and Banking at Universidad Santa Maria La Antigua (USMA), and holds an MBA with an emphasis in International Business from Lindenwood University in St. Louis, Missouri.